No Bake Peanut Butter Bars that are gluten free, sweet and salty and oh so delicious! This easy Peanut Butter Bars recipe uses just 5 ingredients – peanut butter, chocolate chips, butter, chips and powdered sugar. Is there anything better than a sweet and salty dessert? I just can’t resist the flavor packed combo. 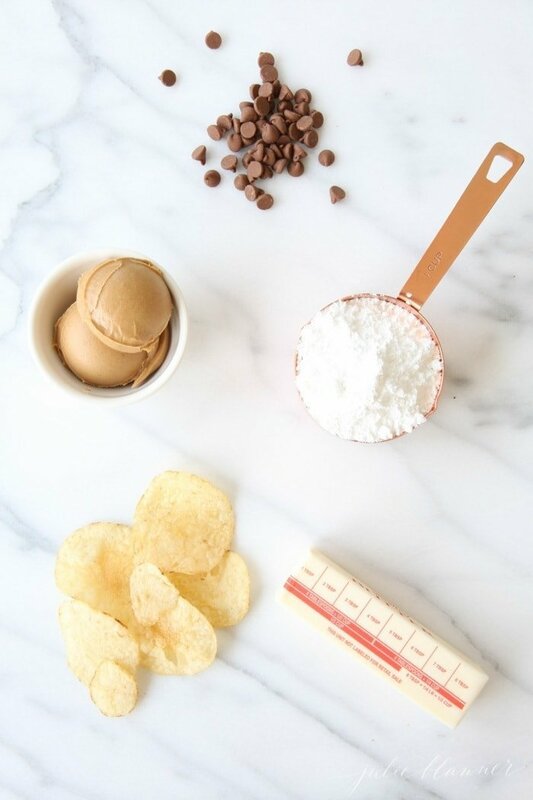 We celebrated with friends over the weekend and I brought my favorite No Bake Peanut Butter Bars made with my Kettle Chips, for some sweet and salty fun! They’re incredibly quick and easy to make, which is essential for last-minute get togethers. They’re delightfully chilled for a fantastic fall or summer treat. 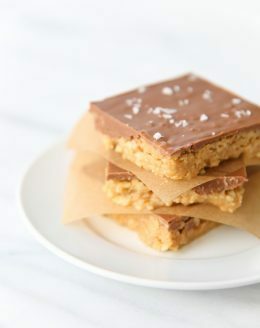 These No Bake Peanut Butter Bars melt in your mouth and can be likened to “crack.” They’re just that good! Shall we get down to the good stuff? This recipe consists of just 5 simple ingredients. Peanut butter, chocolate chips, powdered sugar, butter and kettle chips, of course! Crush kettle chips and blend with peanut butter, butter and powdered sugar. Pour into lined baking dish. Melt chocolate chips and peanut butter and pour over the chip mixture. Refrigerate, cut and enjoy! I love the slightly crunchy crust paired with the smooth chocolate. I added a little sea salt. You know, for good measure! Many of you will be happy to know that these fantastic bars are also gluten-free! 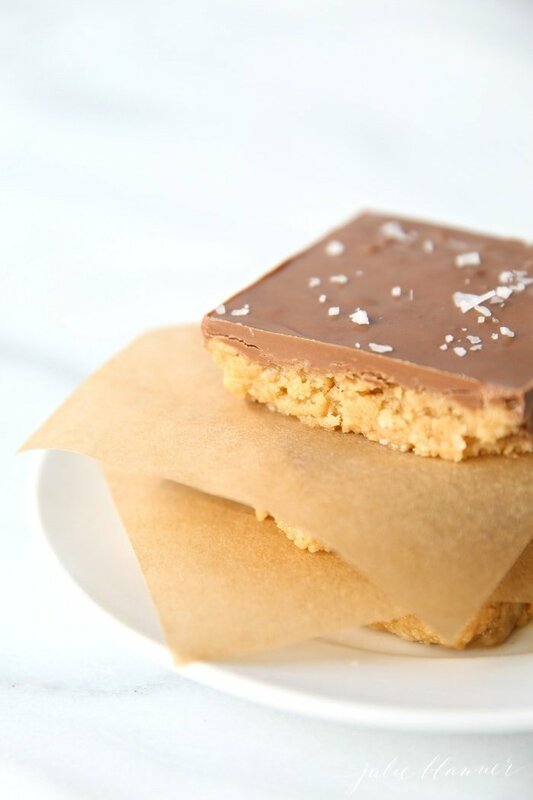 No Bake Peanut Butter Bars that are gluten free, sweet and salty and oh so delicious! 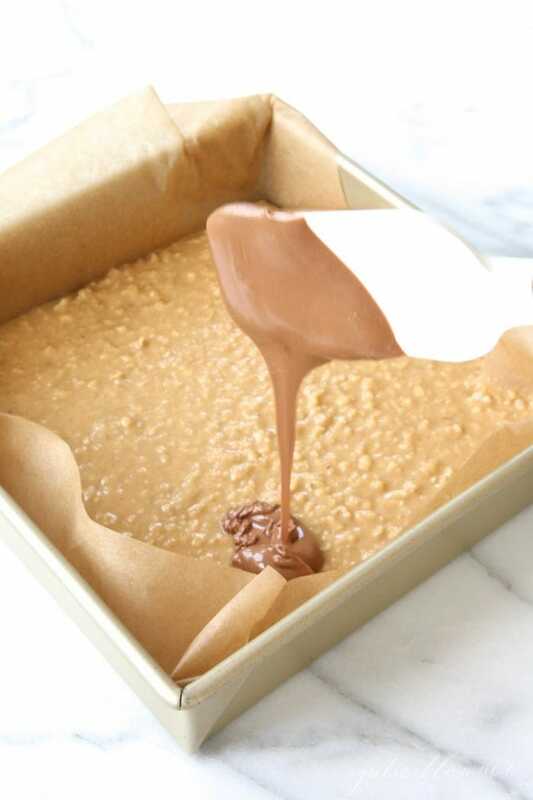 This easy Peanut Butter Bars recipe uses just 5 ingredients! 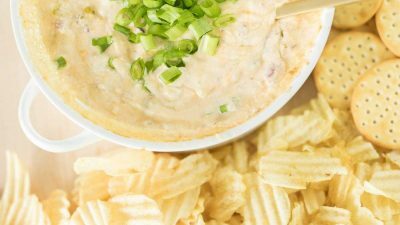 Using a food processor or a tightly sealed bag and mallet, crush chips and pour into a large mixing bowl. 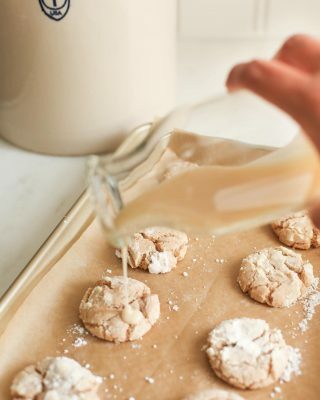 Mix 1 c peanut butter, powdered sugar and butter into the crushed chips. Pour into 9x9" pan. I line mine with parchment paper, but they come out easily, even when ungreased. Combine chocolate chips and ¼ c peanut butter. Microwave in 15 second intervals until smooth. Pour over the chip mixture, using a spatula to smooth. 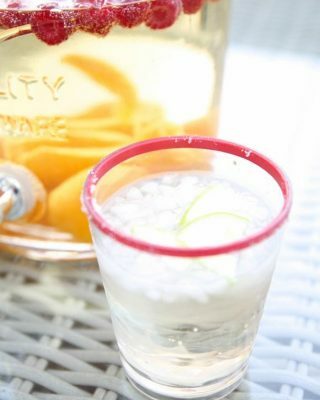 Refrigerate at least 2 hours and serve chilled. You can cut butter down to 8 Tbsp if you wish. 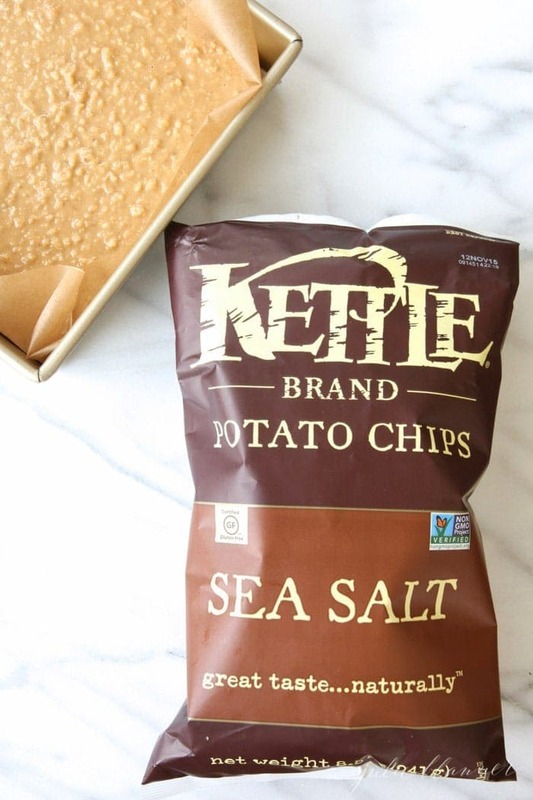 Kettle Chips are my favorite! Love these bars! Mine, too! I can’t be trusted with a bag of them solo! Thanks Maria! I need to make these! 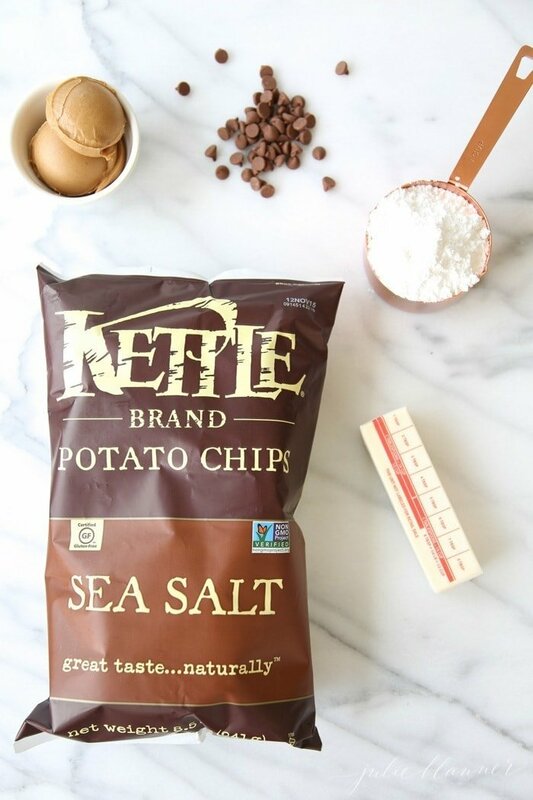 Those Kettle brand chips are my favorite, and let’s face it, mixing them with peanut butter and chocolate is only going to make them taste better! 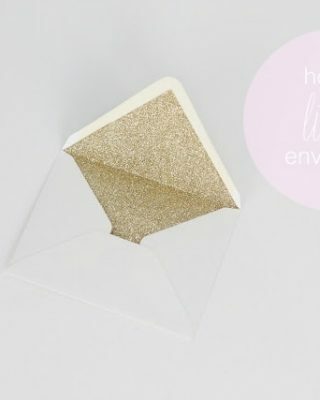 I need these little dream bars in my life!!! I’m always happy to give you nearly dangerous ideas, Chris! Salted or unsalted butter? These look delicious. I think I’ll make them this weekend. Thanks. I use unsalted, but hey – I top them with salt, so you can go either way! Sweet, Salty -AND- Peanut Butter? Yes, please! These sound delicious. You had me at no-bake! And Kettle Brand (love them)! And sweet and salty. Ok, I just love this all. kettle krinkle salt & pepper chips are my achilles heel. I can’t stop buying and eating them! love kettle! Thank you, Jane! They are all great – it’s hard to refrain. I can usually take it or leave it with potato chips. But Kettle Chips. Oh, so hard to resist. Love this crust on these bars! Right, Brenda? Me, too! Have a great weekend! How long do they stay fresh for? Do they taste the same on day 2? Yes, they pack the perfect crunch on day 2. Enjoy! What size bag of chips? 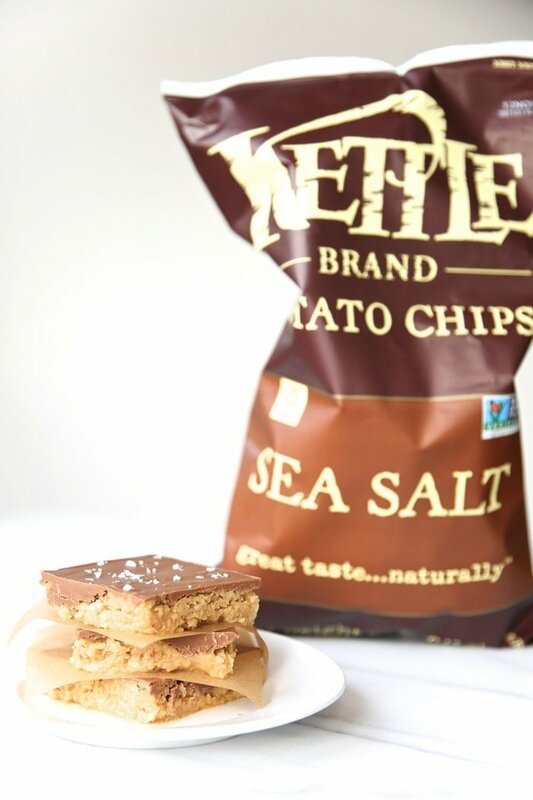 Kettle brand is 8 1/2 ounce bags – these bars are ridiculously good, enjoy! Am I reading correctly that the recipe calls for 12 T butter? Any special kind of peanut butter, chocolate chips, or powdered sugar to make this GF? Nope! All ingredients are gluten fre. Enjoy! My mouh is watering just looking at the pictures! What weight is 12 t of butter? We Scots struggle with your US measurements? Just about got the cup measures sorted. Processed – I love natural peanut butter, but personally don’t think it works well in recipes. Enjoy! I’m a bit confused by the recipe. It calls for peanut butter in two places is it a 1/2c in each place? Sorry, I had peanut butter listed twice – 1 c for the chip mixture and 1/4 for the topping, but I clarified it in the instructions. Now I’m craving them and making them myself this weekend! Thank you! So excited to try them! Of course, thank you for following along! PS, I gave in and made them the day you commented. I can’t resist! Just made these yesterday!! They are so good!! I think I should have put the bottom part in the refrigerator for a little bit before putting the chocolate top on. Either way…they were delicious!!! Thank you!!! I made them for a coworker who can’t have gluten. I’m actually making them tonight! Thanks for sharing. Have a great weekend! Potato chips and peanut butter?! Lord, I’m sold. The 12 tb of butter was way too much in my opinion. They taste like you are eating a stick of butter. Would probably be much better with only 8 tb. Thanks for the feedback, Nicole. I might love butter all too much. I just made these! They are currently in the fridge as we speak! 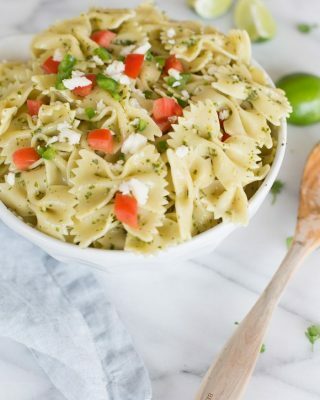 Thank you for this unique recipe! Oh my, I wish I didn’t love these so much! Now I can’t stop thinking about them. I hope you love them as much as we do! These look great. I thought I would try them with regular or dark chocolate chips. Have you tried that? I’ve had them with both – I prefer milk chocolate, but dark chocolate is also delicious. Enjoy! looks yummy and great pictures! 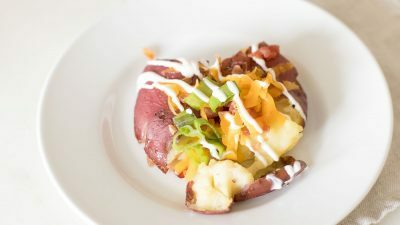 Hi – I can’t find the link to the printable version of this recipe or the video. Can you please upload it. Oh gosh, I have a glitch with my recipe card and am in the process of converting…thanks for letting me know! The video is at the top of the post, may take just a sec to load. Enjoy!